I’ve learned how to use my spinning wheel – at last! It has been sitting in my spare room doing nothing but providing entertainment for the kids as they are so attracted to watching the wheel spin. My Grandad tried to teach me, and then many years later my friend tried to teach me, and finally Melissa has succeeded. I proudly took home a ball of brown yarn. Lumpy and thick, but nonetheless it is definitely recognisable as yarn!! Here is me concentrating hard – I felt like I was learning how to drive a car: thinking all at once about what my feet were doing, and my hands, and checking that it was running through ok …. it took me about 2 and a half hours (maybe more but we were talking so much!) and I think I’ve got it now. 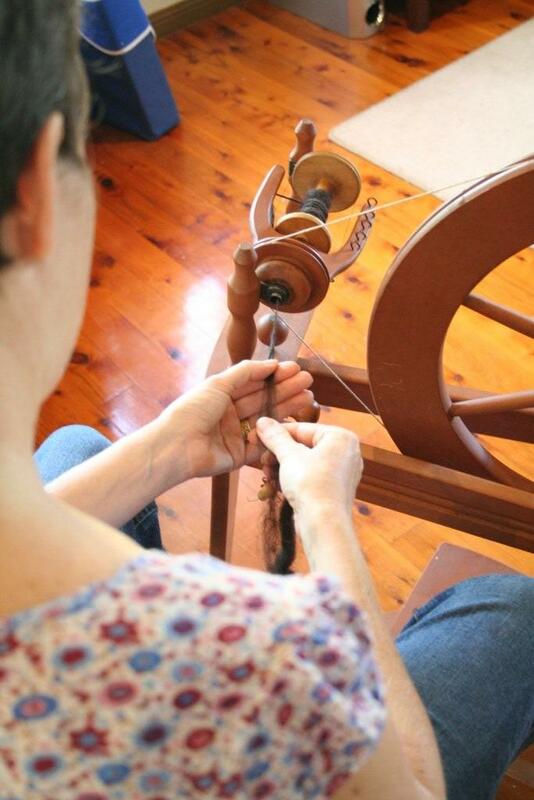 I raced home and began testing out my own wheel and have nearly spun two bobbins of ‘Nutmeg’ Corriedale yarn! I forgot about dinner – I wasn’t even hungry. The kids went to bed an hour later than usual after I plonked down in front of them a humble meal of pasta and pesto and went right back to the spinning wheel ….so maybe this isn’t good. Do I need another fibre craft addiction? I went to bed with my foot still feeling like it was gently rocking the pedal, my back still swaying with the motion of feeding fleece into the wheel …. ← You do not like Green Eggs and Ham? oh dear….I think I may have ‘enabled’ you 🙂 Well done Jen! And it was my pleasure. yay for you. 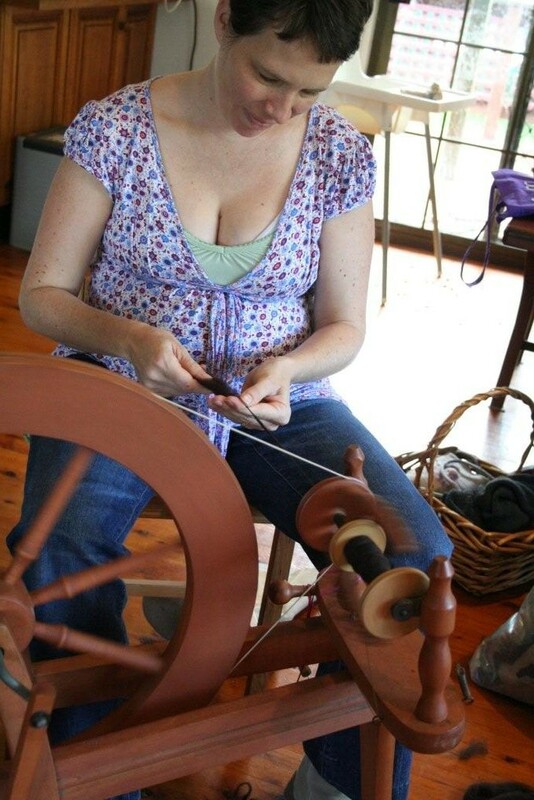 I have a spinning wheel too…did a day long workshop once, spun some very odd looking wool and after 6 or so more months the wheel has gone back under the stairs – there is just not enough room at my house for all my crafty things and the ones i’m still getting to. Jealous! This is on my list of things to learn. I assume you spun fleece tops that we use for felting? Will you knit something with your yarn now? Where did you get your wheel? The one in the photos looks lovely. Well done you! Flic the wheel we’ve had here for a while – Mum and Dad found one for me second hand but I passed that on to a friend who knew how to spin … then Dave found one on the trading post at his work. It came with all the bobbins and everything. It has been sitting here for a year … but it is idle no more! I am on to some scarlet yarn now – and yes, I am using the roving that I keep for felting – plenty of that around here!